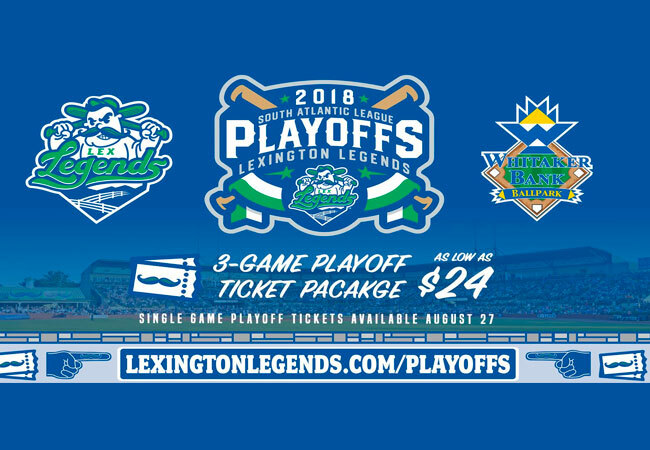 WHITAKER BANK BALLPARK (Lexington, KY) – The Lexington Legends are excited to announce that 2018 South Atlantic League Playoff tickets are now on sale atwww.lexingtonlegends.com/playoffs! The Legends, Single-A Kansas City Royals affiliate, will look to clinch a playoff berth during their final homestand of the season, which begins tonight at Whitaker Bank Ballpark with a 7:05pm game versus the Hagerstown Suns. The Legends have not earned a playoff bid since the 2006 season, but currently sit atop the standings in the Southern Division. “This has been an electric team to watch all season long. We could not be more excited to have the possibility of playoff baseball at Whitaker Bank Ballpark this season! Fans will not want to miss catching these postseason games in Lexington! Not only will there be fantastic baseball on the field, but fans can participate in ‘Why Not Wednesday’ when we pack all our weekly promotions into one day,” said Legends President/CEO, Andy Shea. Fans can purchase 3-game Playoff Ticket Packages for the entirety of playoffs right now at www.lexingtonlegends.com/playoffs. Prices range from $24 Box Seats to $66 Diamond Club seats for all three games to be played at Whitaker Bank Ballpark, slated for September 5, 11 and 12. All ticket purchases are final. Fan accounts will be credited with tickets during the 2019 season for any games not played, or if the Legends are eliminated from the playoffs. Single game playoff tickets will go on sale Monday, August 27. During the September 5th game at Whitaker Bank Ballpark, all fans in attendance will be able to take advantage of ‘Why Not Wednesday’ where fans can experience all of the Legends 2018 weekly promotions all in one day! All Kids 12 and under will receive FREE playoff tickets, and all Members Heritage Credit Union members will receive a free playoff ticket when they show their card at the Legends Box Office upon arrival! 25¢ Eisenberg Hot Dogs will be available throughout the game and it will also be another Pepsi Bark in the Park, where fans can bring their four-legged friends to the playoff game! Select beers will also be $1.00 during the playoff game on September 5th. Also for the September 5th game, fans can purchase a Rough N’ Rowdy Ticket Package ($30) that includes a Legends Box Seat playoff ticket and an Outfield General Admission ticket for Rough N’ Rowdy – Brawl 5, coming to the ballpark on October 5. This package is available now atwww.lexingtonlegends.com/playoffs! Fans can purchase tickets at www.lexingtonlegends.com/playoffs or visit the Legends Box Office at Whitaker Bank Ballpark. Purchases can also be done over the phone by calling (859) 422-7867.